Ever read seen those movies where the protagonist has to save a fantasy world from oblivion? Yet, the concept is based around fictional characters dying because people have stopped reading the stories and legends. Sounds like the plot of The Neverending Story, right? Several television shows have made parody of this, but the point remains the same. Characters die off because they are ignored and pushed aside by the masses. I feel this way about heroines in comic books and pop culture. Time and again, I’ve been in debates in regards to “Female Avengers.” As a designer, I love some of the concepts, but I think it’s time to move forward. It’s always been a longtime discussion if hero themed comics are part of the boys club. Images of Bart, Milhouse, and Martin huddled up in the treehouse partaking in ownership of Radioactive Man come to mind. Remember the episode when Milhouse gets a girlfriend and Bart recommends her a few comics that are far from a lady-friendly aesthetic. I felt this way in the 90s when I started getting into fandoms – there weren’t many female friendly heroines. Lady Death and Vampirella decorated the walls of the local comic book store. This is why I turned to shoujo manga (Sailor Moon, Wedding Peach, etc) at the early age of 12. Truth is, while American comics have made way for more heroine tales, it still has long ways to go. Rule 63, or gender bent variations of male characters has been a popular trend in hero oriented cosplay. You may have seen cosplay and fan art of female Avengers posted around. This was pretty cool the first time around and I’m fine with people’s cosplay choices, but there’s was something that bothered me about it. After reading plenty of articles regarding heroine comics taking a backseat, I wonder if it’s time to move forward. While there is no question that the Avengers movie has inspired a new breed of comic book fans, with newbies, there also comes the stupidity that comes with it. It’s happened in the anime community. Veterans are happy to help newbies, but there’s always the echelon of newbies who wish not to be helped and live only within the parameters of the move universe. There were times when I mentioned on Facebook posts about the existence of Valkyrie and She Hulk, but have been brushed off with a “Who the @#* are they?” or a “Who cares? !” This wasn’t said by boys, but by girls who were new to the franchise. The troubling part as someone who likes to get more people into the larger MCU / DC-sphere, it’s this ignorance that kills the fun. We always talk about how there’s a lack of visible heroines in comics. Yet, I think it’s time to move forward. It’s been argued that Rule 63 promotes heroines like Valkyrie, Kate Bishop, Enchantress (villainess, yes), etc, but I argue that it does not. When you cosplay as femme Thor, it’s still Thor. It’s not Valkyrie. I’ve been to cosplay panels that totally dismiss the existence of these characters. While there are existing heroine series, I do not see much representation of it in the cosplay world. I’d love to see more Birds of Prey cosplayers. 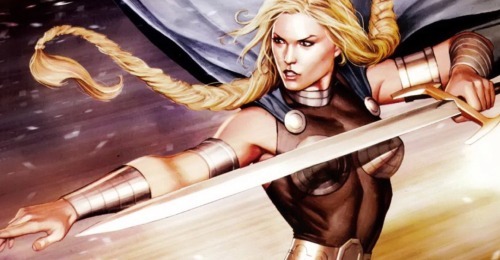 I really do hope that the new Thor movie really shows off Sif and Valkyrie so they can get more love from female fans. Something I’d like to do in the future is to assemble a team to do a “Missing in Action: Heroines in Comics” panel. I was close to having one early this year, but my panelists backed out. I really do feel the need to do this at conventions that attract the anime-to-comics crowd that welcome these types. It would require comic veterans that are versed in comic knowledge and can recommend great series to buy and which ones to avoid. If you’re new to comics or somehow got introduced to the Marvel and DC universe because of the recent movies, definitely take some time to read up more on the universe. There’s a whole world outside the movies. The current Avengers animated series does have female avengers involved (hi Wasp!). If you’re new to comics, be willing to learn. Having a snotty attitude thinking you know everything (but don’t) to impress others is the wrong way to go and it doesn’t make you better than anyone.